You'll need to keep your tools and paints organized if you want to get to work faster. 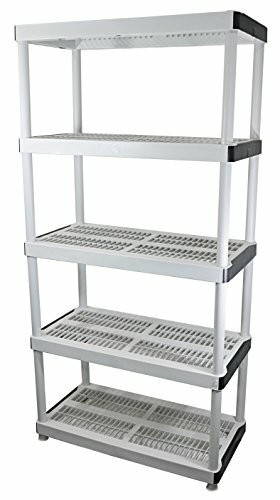 With HDX, you can pick up this 5-tiered shelving unit. Its easy assembly and sturdy construction will serve you in any room of the house and beyond, from the basement to the garage. Each of its five shelves can hold up to 150 pounds for a total of 750. That's almost a half ton of storage space at your disposal. It's easy to put together, too. No tools necessary; just slide the pieces together and you'll be ready in minutes to put stuff on there. The shelves are ventilated, too. This is useful for long term storage. It keeps a low surface area for dust to collect and improves air circulation, providing extra protection to whatever you have placed on it. This makes for easy cleanup, too, particularly if you're storing items outside. Whether you're storing paints for your next renovation project, or power tools for your diy projects, keep HDX in mind for your storage solution needs.